Michaela Rosenthal is a Montana native who has lived in California for more than 25 years, and she comes from a family of good cooks — one of those “rare” Californians (no pun intended) that repares beef 3-4 times a week. Not surprising, since she grew up on a ranch. Obviously, she has the touch. In just a few months since she began contesting, she has been a prize-winner in several national contests…. “If someone would have told me the course of events my life would take this spring, since I started entering contests, I would have never believed it!” she says. 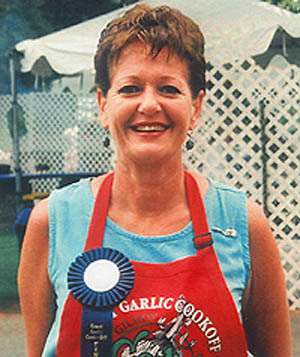 NOTABLE WINS: Finalist, Gilroy Garlic Festival, 2004; First Place, Lindsay Olives, 2004; First Place, McCormick “Spice for All Seasons,” 2004; Semi-Finalist, Lawry’s Healthy Grilling Contest, 2004; Winner, Kaiser Bakeware Monthly Contest, 2004; Honorable Mention, Better Homes & Gardens Monthly Contest, 2004; Honorable Mention, Empire Kosher Poultry, 2004. BEST SURPRISE WIN: A couple of years ago I was having a fancy (expensive) sit-down dinner party for 10 people. Right before I was to start serving the first course, I noticed that the tip to my chef’s knife was missing!!! Not finding it on the cutting board, I was forced to throw the whole dinner out. I was devastated, having cooked for two days!… We ended up ordering take-out.